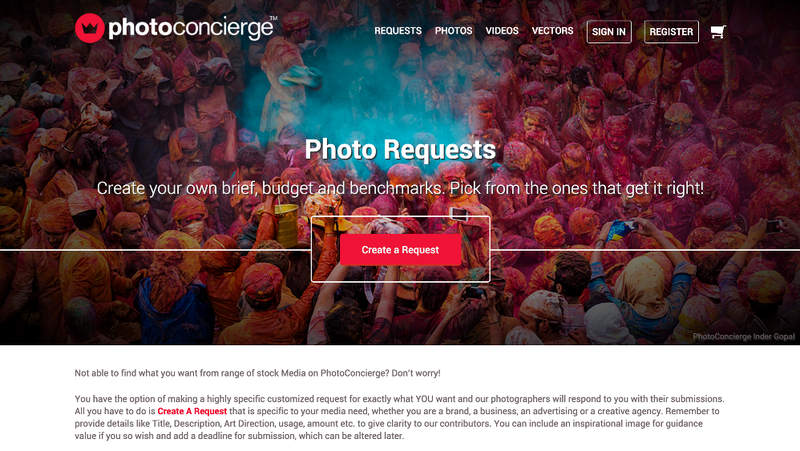 Bengaluru, Karnataka, India: PhotoConcierge today announced the launch of its web-based platform. With the growing demand for customized content, the Bengaluru-based company aims to provide a stock repository of photos, vectors, and videos to marketers and individuals. This free to sign up platform will also enable photographers, illustrators, and videographers to upload media, connect with buyers as well as sell visual content. PhotoConcierge currently houses a library of 100,000 media and already has close to 200 contributors on the platform. Providing a repository of artwork from a cross-section of categories, the platform offers customers royalty-free on-demand visual content. The unique ‘Requests’ feature allows individuals and brands to place custom media requests based on their budget and deadline, differentiating PhotoConcierge from alternatives in the space. Contributors from around the world then tailor-make content suited to those requirements. Through this platform, illustrators, photographers and videographers can not only showcase their work but also monetize their content. Backed by $1.5 million in outside investment, the company plans to soon expand into Singapore, Hong Kong, Thailand and Australia and is working on both Android and iOS mobile apps to serve a larger clientele. The Android app is expected to launch by the 21st of this month. “The team is committed to maintaining a high standard when it comes to data security and providing quality support to both contributors and buyers. As we expand operations, technology will continue to drive business growth and innovation,” said Stan Dong, co-Founder & Head, Technology, PhotoConcierge based in San Francisco, USA. PhotoConcierge is raising awareness about its platform not only through marketing and digital efforts but also through sponsorships, starting with the Chennai Photo Biennale that will take place from February 26th to March 13th. With this simple but custom offering, PhotoConcierge, plans to redefine stock photography in India. For more information, please visit https://www.photoconcierge.com/. A digital marketplace for photos, vectors, and videos, PhotoConcierge, provides royalty-free on-demand content to both individuals and marketers. Providing a repository of artwork, the platform allows photographers, illustrators and videographers to upload content, connect with buyers as well as sell their artwork. Brands and individuals can also request for customized artwork and contributors will create content suited to the client’s requirements. A global company that aims to build a community of artists across the world, PhotoConcierge is headquartered in Bangalore, India.